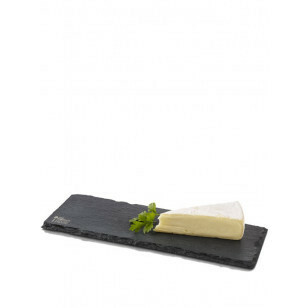 The Monaco Cheese Board Small is made of black slate, offering an appeal that is both stylish and rustic. The narrow board is ideal for the serving several small pieces of cheese, or 1 round of cheese along with sliced baguette or toast. The light color of cheese against the black slate are a striking combination that are sure to be eye-catching on any tabletop or dining situation. The board is dishwasher safe (dimensions are 12.99 x 4.5 x .3 inches).